Do not forget to bring the chicken to your next outdoor family gathering! 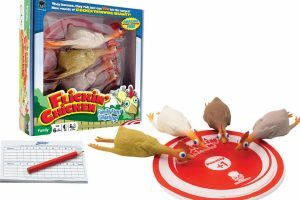 This Flickin Chicken game is one of our top Backyard Games and is a laughing good time. This is a game for all ages, designed to be played with 2 to 4 people. Your kids especially will have almost as much fun just playing with the rubber chickens as they will be tossing them across the backyard. Imagine a mix of miniature golf and rubber chickens. The objective of the game is to toss your rubber chicken as close to the target as possible in the least amount throws. It sounds simple but wait until we take you through the Flickin Chicken Game rules and provide our hilarious review. Flickin Chicken gives a whole new meaning when you decide to bring this game to a BYOM BBQ! The Rules for Flickin Chicken is similar to miniature golf. Instead of using a putter and golf ball you instead throw a rubber chicken at the target instead. You will want to land their chicken on the target in the least amount of throws possible. Each pack comes with 4 chickens so pay attention to which colour is yours. It will be your chicken for the game and we suggest naming it. Naming your chicken before you begin can be a hilarious start to the game. Some awesome chicken names include Big Bird, Albert Eggstein, Chicken Little, Cluck Rogers, Dixie Chick or Mother Clucker. We could go on! Included in the Flickin Chicken gameset is a notepad and pencil so you can easily keep track of the scroes. Just like minitiature golf, each player counts how many throws it takes to get their chicken to land on the target. The number of throws is the number written on the scorecard. You are free to make your own rules and variations. Here are the Flicking Chicken official rules. The youngest player goes first to start the game. They will throw the disk target as far as they can and then toss their own chicken. After the first round the winner of the previous round throws first with the target disk and their own chicken. If there was tie, then the winners rock scissor paper for it. Once the initial target has been thrown each player takes turns throwing their own Flickin Chicken at the target and try to land it on the disc. If any part of the rubber chicken lands on the target in the first throw it is called a “Pollo-In-One.” It is like a hole in 1 in golf but so much cooler! After all the players have thrown their chickens for the first time, it is now time for their second through (if required). The furthest away chicken from the target will get to throw next. Pickup your chicken from where it landed and continue throwing it towards the target. Just like in golf it always continues with the next furthest chicken from the target. Keep playing until all players chickens have landed any part of their body on the disc target. Like a golf ball in the hole. Once you chicken has landed on the target you need to remove it from the play. Keep track of how many chicken toss each player throw and so the score keeper can keep track of all the points. The Target disc has 2 sides a bonus and a penalty. Each round the target disc may land on either side with this facing up. In the middle of the disk is a smaller circle and if you land in it while on the bonus side +1 point. If any part of the chicken lands on it while on the penalty side – 1 point. Flickin Chicken is played over 9 rounds and the player with the lowest score after this time wins. Flickin Chickens is one of those games that the entire family will love. The way that the chickens bounce and roll when throwing them makes the game unpredictable and fun. The game is meant for kids 6+ but we played it with a 4-year-old birthday party and was a hit. Since you never know where the chicken will bounce you cannot be too skilled at this game making it fair for all players. Children may not play this game too long, but we can guarantee that they will not get tired of playing with the hilarious rubber chickens. Time for you to start Flickin Chickens in your backyard with one of the best outdoor games for kids and adults alike! Flickin Chicken can be found on out Ultimate Outdoor Games List and the Outdoor Games for Kids List. *Featured image and Flickin Chicken images are source from Haywire Group. Game description: Hilarious game called Flickin Chicken for 2 to 4 players. Take turns throwing 4 rubber chickens at a target and see who can get the highest score by getting closest.